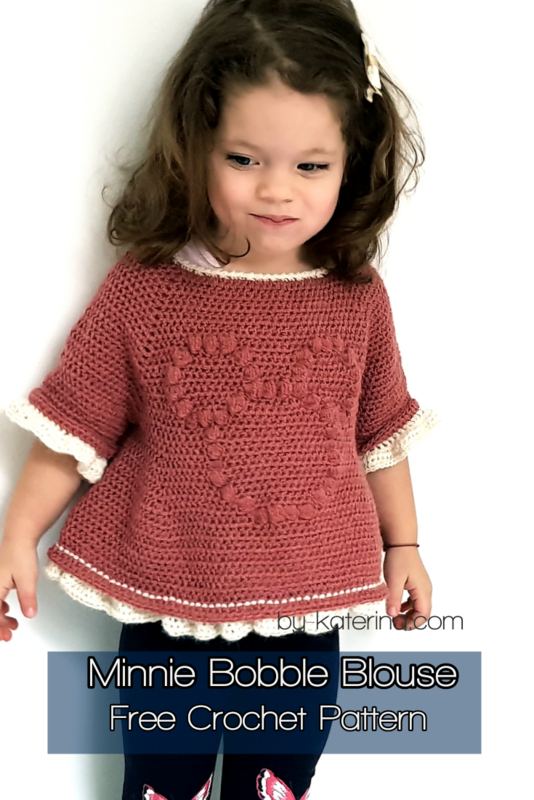 I just love the Minnie Bobbles Blouse. It’s so cute and your princess will love to wear it for sure. If she will want a dress, the length can be adjusted so easy just by adding more rounds on the body length. 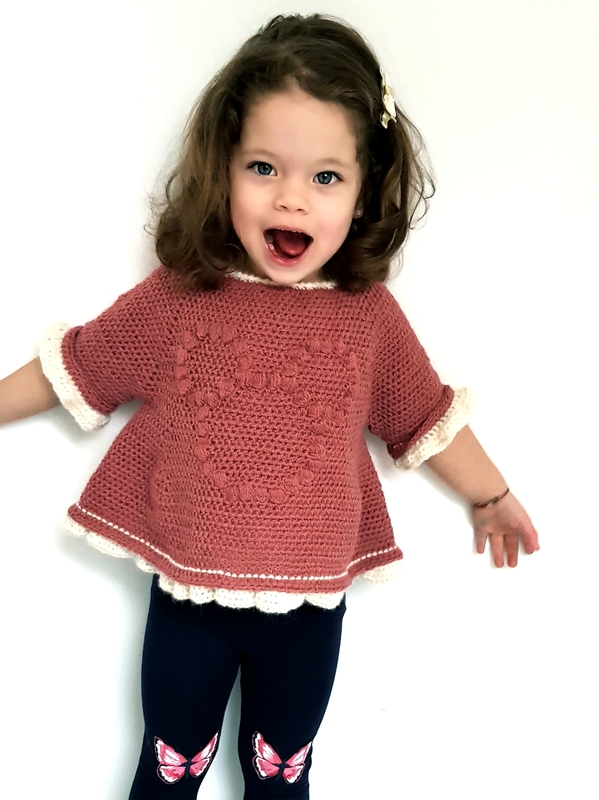 This cute blouse is worked top-down made with the raglan technique. We will work the top part, the yoke, then separate the sleeves from the body and then work the 3 parts individually. The Bobble Minnie pattern is worked as we go. 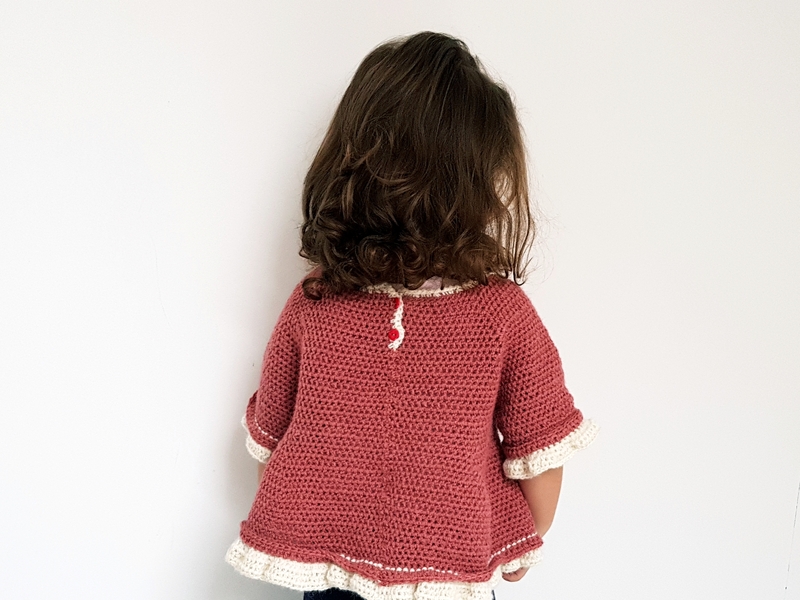 The blouse has an A shape made with some increases after finishing the yoke part. If you want it straight, you can follow the pattern without making the increases. 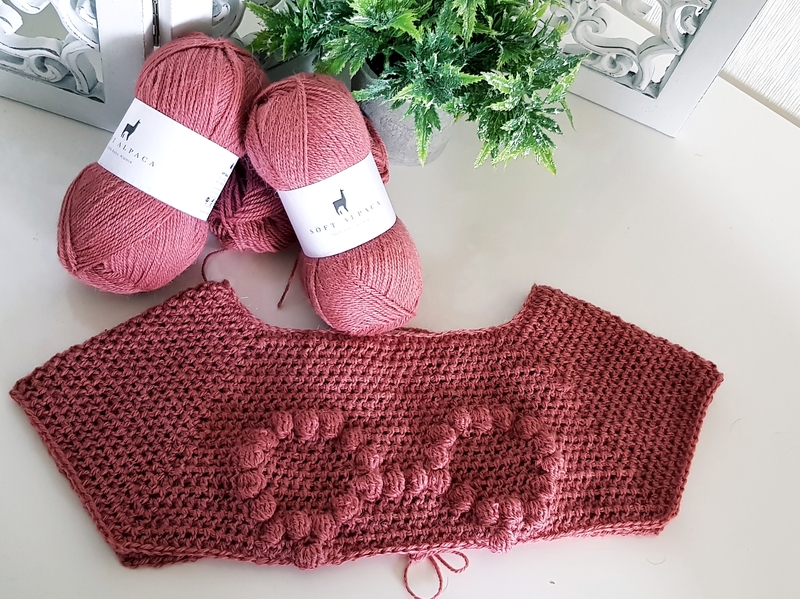 For this blouse we are using the half double crochet stitch. What is different is that I made the stitches inserting the hook trough all 3 loops of the previous round stitch. We will work in rounds, but we will work on the right side and wrong side. Each small square represent one stitch/row and the brown stitches are the bobble stitches. 1 Bobble stitch is a cluster of 5 double crochet made in the same st.
Yarn over, insert the hook through the stitch, yarn over and pull out a loop. Repeat 5 times then yarn over and pull the yarn through all the loops on your hook. After making the bobble don’t make a chain. Just go into the next stitch and make the half double crochet. 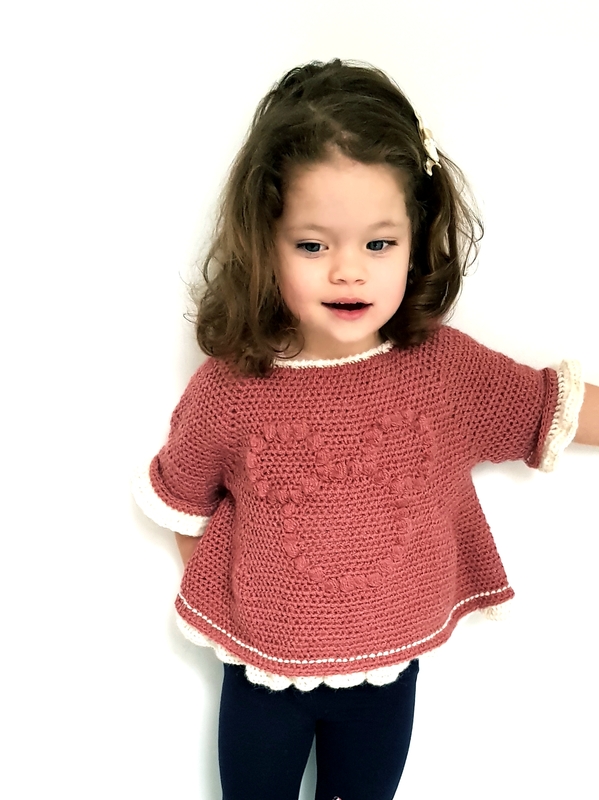 The Minnie Bobble Blouse pattern is available for sizes from 2 years up to 8 years old and is wrote in US terms. Skill Level : Intermediate, but I’m sure that an experienced beginner will manage to make it to. 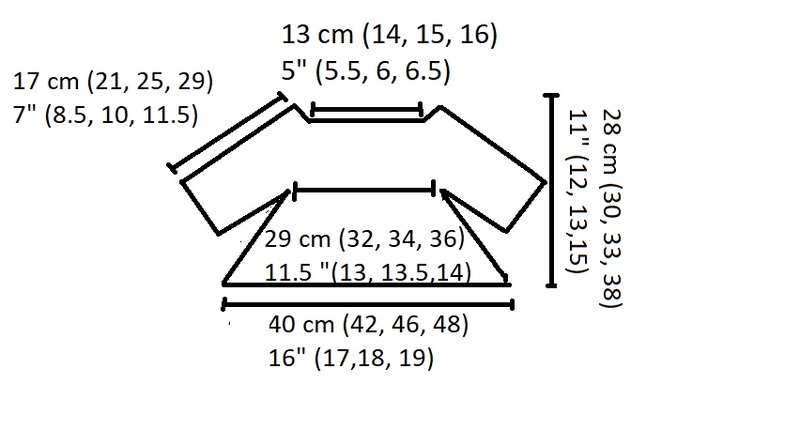 The final measurements of the blouse for each size are represented in the diagram below. *on the first line are the values in cm and on the second one in inches. *1st value is for size 2 years. Between brackets are the values for sizes 4, 6 and 8 years old. Hobbii Soft Alpaca. Each skein has 50 grams and 165 m. I used 2 colors : Coral as a main color and White for the brim. How much yarn do you need? 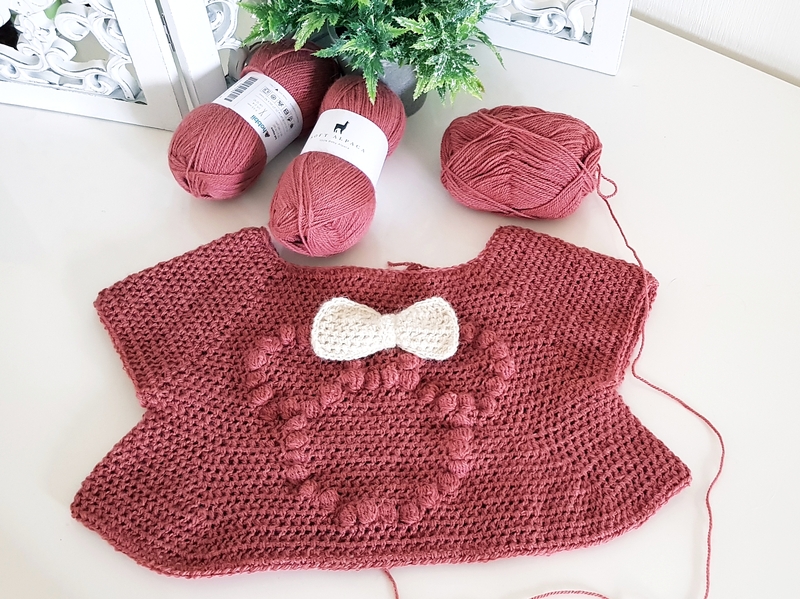 Now that we have all the details to begin with, let’s start making this super cute Blouse. *we won’t join the ends of the chain because we will work 10 rows, letting the blouse open to add 2 buttons at the end. [1 hdc (make the hdc inserting the hook trough all 3 loops) in each st until you get to the next corner (ch 2 space from the previous round), 1 inc in the ch 2 space]. Repeat to the end of the round. Join with a sl st with the first hdc. Ch 2 and turn. Repeat round 2 until you have in total 10 rounds. At the end of round 10, join with a sl st and we will start working circular. Turn after each round. 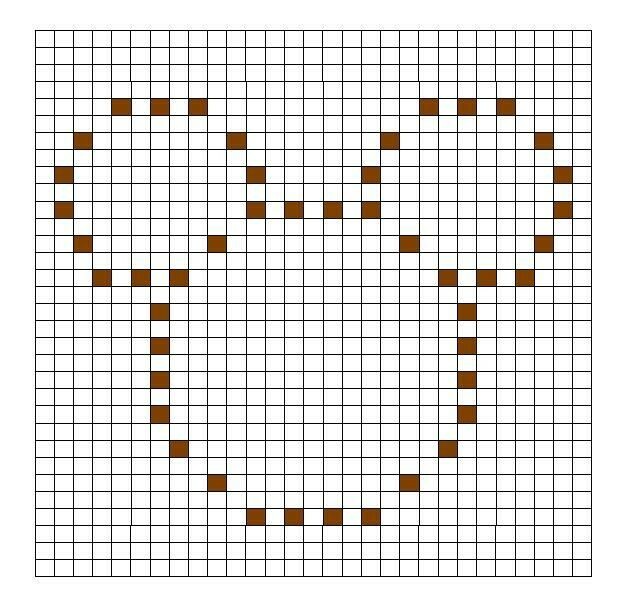 Starting with the next round we will make the Bobble stitches for the Minnie Pattern. Because we will need to center the Minnie pattern, count the number of sts that you have for the front side. The 1st row of Minnie pattern has 21 sts wide. After counting the number of sts for the front side, mark 21 sts in the middle. Start the round as usual. Continue to increase in corners because the yoke is not done yet. When you will get to the first st marker (which represents the first bobble st of the minnie pattern), make 1 bobble st as explained above, then continue with 1 hdc in the next st, 1 Bobble in next, 1 hdc in next, 1 bobble in next, 1 hdc in next 11 st, [1 Bobble in next, 1 hdc in next] repeat 2 more times. Continue the round as usual. Keep following the Minnie Bobble pattern on the front side. 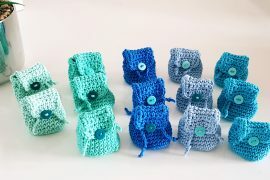 After each round with bobbles you will have 1 round just in hdc and the next will be again with Bobbles. 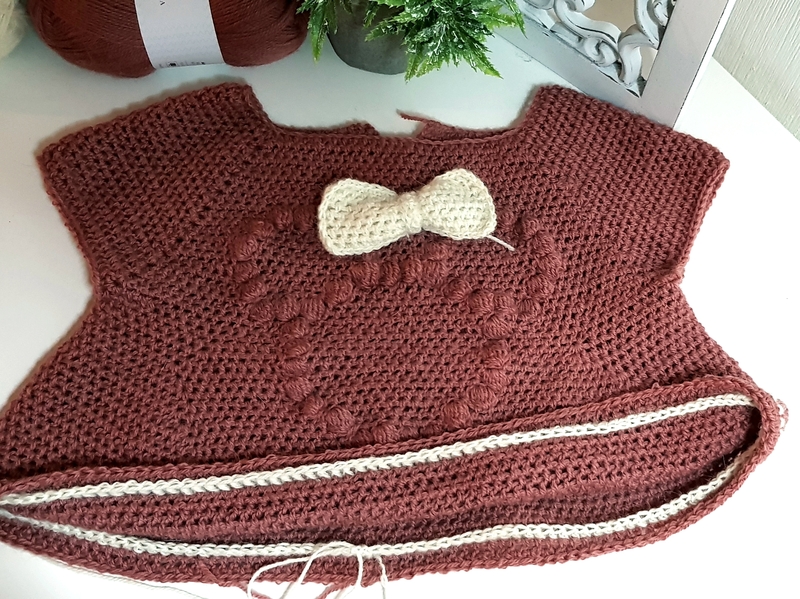 After finishing the yoke, we will separate the body of the sweater and the sleeves and then we will start working the 3 parts individually. After finishing the front side and you reached the 3rd corner, you will have to proceed the same as for the first sleeve. 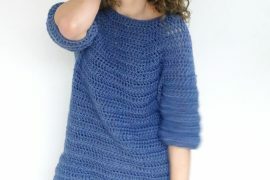 Make one partial hdc in the 3rd corner, skip the sts for the sleeve, 1 partial hdc in the 4th corner, yarn over and pull the yarn through all the loops on the hook. Continue with 1 hdc in each st until you will get to the end of the round. 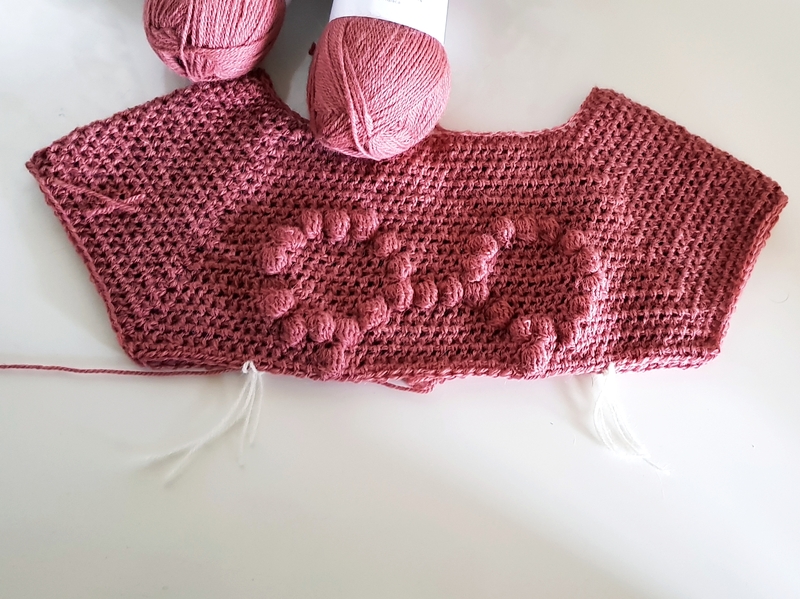 After the first round of the body, we will have to mark 2 sts on the front side and 2 sts on the back side in which we wil increase to give the blouse the A shape. Count how many sts you have from the left bobble to the edge of the blouse and put a st marker in the middle. Proceed the same in the right side. On the back, mark the corespondent st of the front side marked sts. Starting with round 2, we will work 1 hdc in each st, and we will make an increase in the 4 marked stitches (2 hdc in the same st). On the front side we will continue to follow the Minnie Bobble Pattern. Work like this 12 rounds. 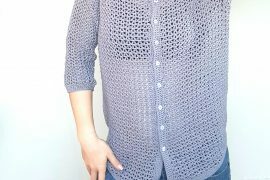 If you want the blouse to be wider you can continue to increase a few more rounds. After 12 rounds, you will continue to work without increasing for as many rounds as you want, until you will have the desired length. After finishing the Minnie Bobble Pattern, continue making just 1 hdc in each st.
We are making the brim in color white. If you don’t want the white line on the right side, you can make the first round of the brim in the main color. Start working on the wrong side, with the 3rd round. Ch 2, 1 Front post half double crochet in each st around. Ch 2 and turn. 1 hdc in each st around. Ch 2 and turn. Repeat round 3, 2 more rounds or as many round as you want if you wish a wider brim. Insert the yarn to the armpit. We will work in rounds the same as the rest of the sweater, working on the right side and on the wrong side. 1 hdc in each st around. At the end work the brim in the same way as for the bottom of the blouse. If you want you can add the same brim made at the bottom of the sleeves and body, on the neck line also. If not just make 2 rounds in single crochet with the white color. If you need you can make some decreases on the first round. And done, the Minnie Bobble Blouse is done now, and ready to be worn. In sfarsit pot sa accesez site-ul ,imi pare bine ca s-a rezolvat.